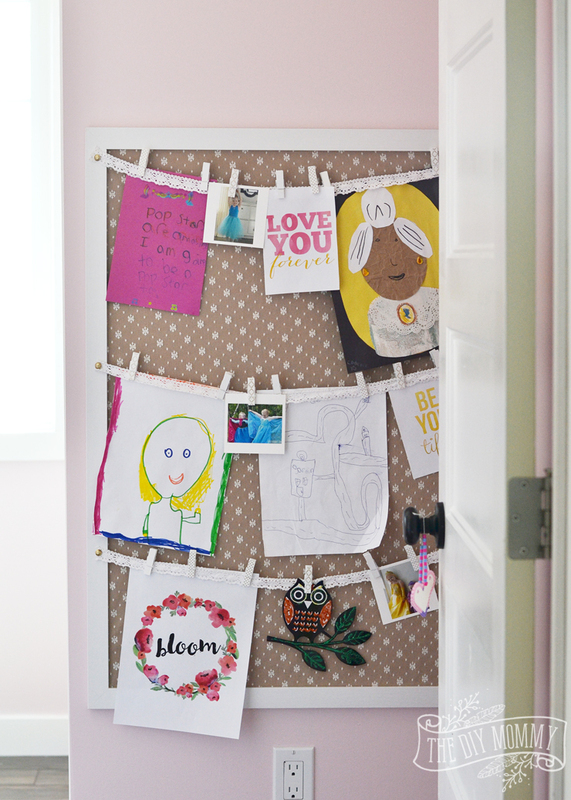 August is a great month to get your kids’ bedrooms organized and ready for the school season. I know my girls’ rooms are definitely messy and disorganized right now – tidying them up and finding a spot for everything would definitely help us feel like we’re more ready for Fall! 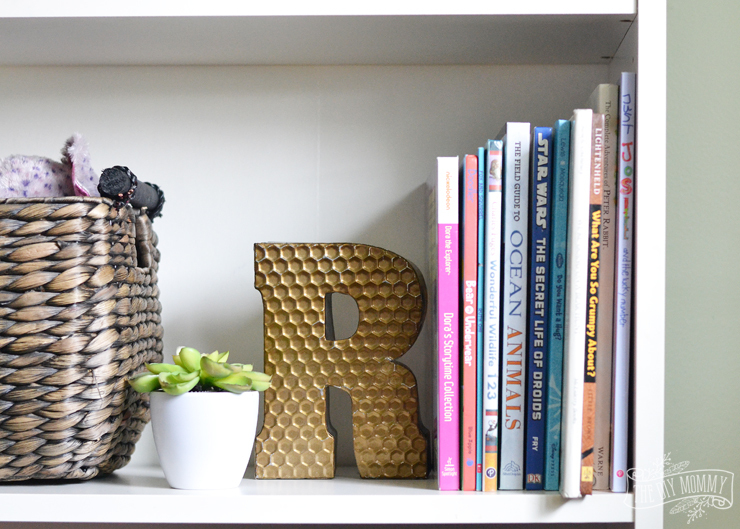 Let’s talk about some kids bedroom organization ideas that aren’t too tricky to do, plus I’ll give you a little peek of my friends’ daughters’ bedroom that we’re decorating. I’d be a giant liar if I said our house was clean and tidy and organized all the time. I’d also be a hypocrite if I listed off kid bedroom organization ideas that I would never actually DO or KEEP DOING in my girls’ rooms. With that in mind, all of these ideas are quite simple to start and I think they’ll be easy to maintain throughout the school year. Who has the time to organized their kid’s clothes in rainbow order? I don’t. (I wish I did – I love rainbows.) However, I DO have the time and ability to do the organization tricks below and get my girls to help me. 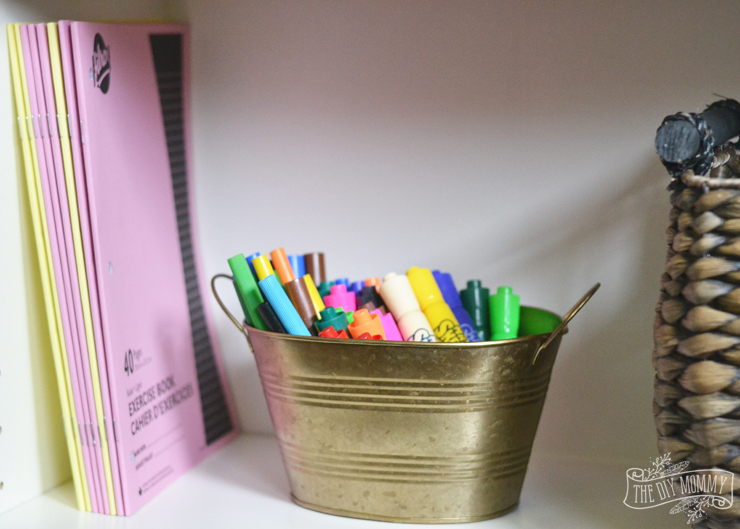 Ready to get your kids rooms organized and ready for back to school? Here are some ideas. Take an inventory of all your child’s clothes and donate or dispose of what doesn’t work anymore. Dump all of your kid’s clothes out on the bed and sort through them. Donate any clothing that no longer fits (or store and keep it for the next kid in line, like we do) and dispose of the clothing that’s damaged. 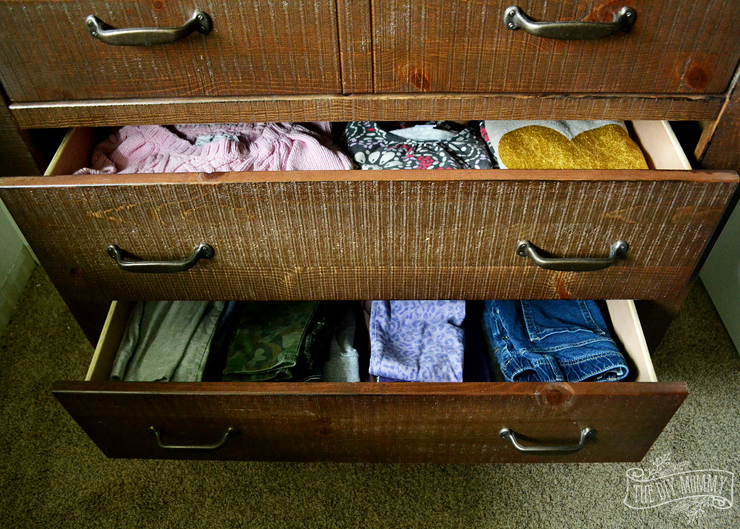 This is a great way to make more room in dressers and closets and to discover what needs to be purchased for the school year. Here’s a peek at the new dresser that we’re incorporating in my friend’s daughters’ bedroom – the Phoenix Chest from The Brick. It’s gorgeous! Solid wood makes this dresser look and feel so sturdy, and it has the perfect rustic finish for Ruby & Zoe’s “rustic glam” bedroom makeover. You can read more about our plans for their room here. 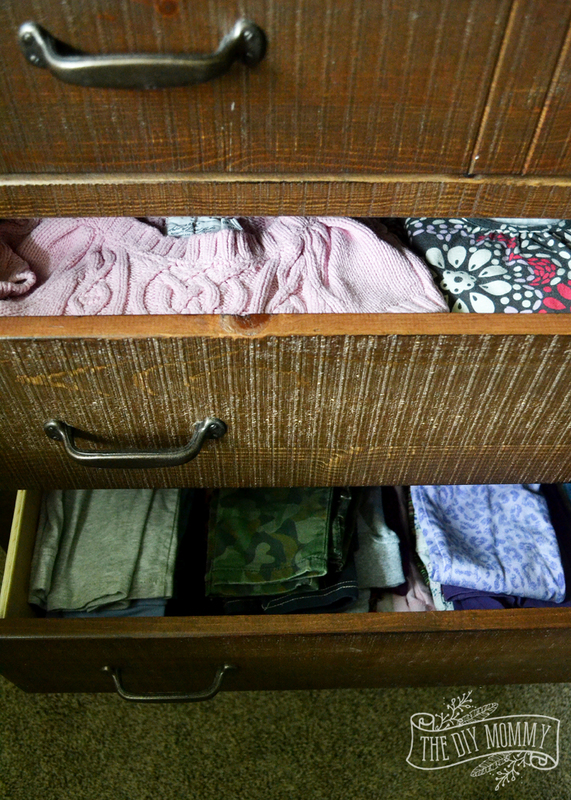 Organize clothing by type into separate drawers. This is probably what most of us do already, but it’s worth it to spend the time to make sure each type of clothing has its specific spot in your child’s dresser and/or closet. If underwear, tops, bottoms, and dresses each have their own homes, it’s easier for your child to get dressed on their own in the morning. Work with your child to decide which spots make the most sense for each clothing item, and help them put things away on their own. Invest in baskets and bins for toy collections. 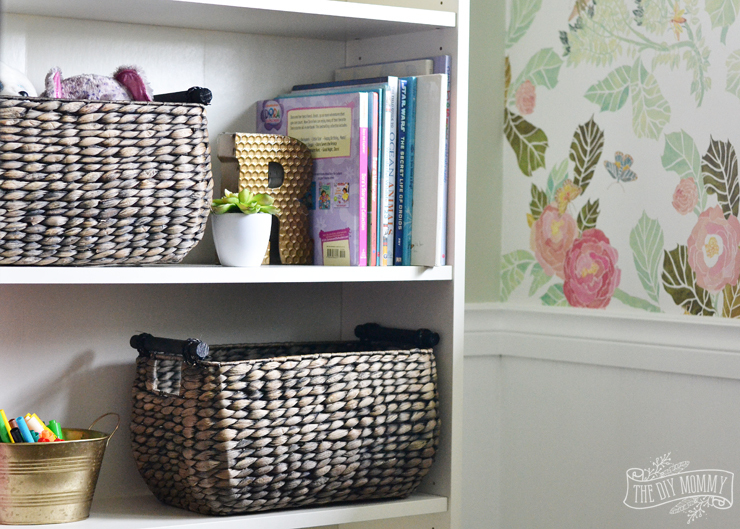 I’m a huge fan of baskets and containers to corral loose items, and in kids’ rooms they work extra well! 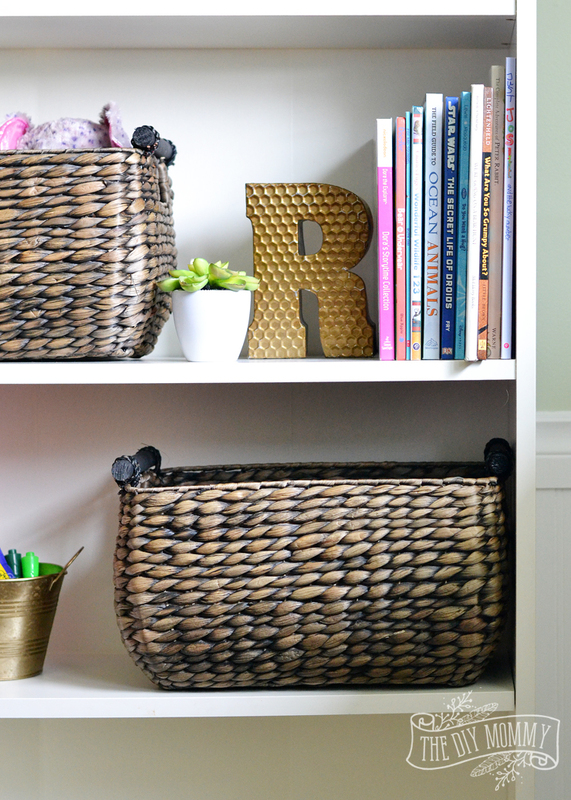 Buy or upcycle a few baskets or pretty containers to organize toys and collections in your child’s room. I like big wicker baskets for stuffed animals and dolls, and smaller tins and boxes work well for art supplies and hair accessories. Create a space for art and/or reading. It’s always a good idea to have a specific spot for your child to display their artwork from school – at least for a little while! We created this easy DIY art display in Little C’s room this Spring. A corner in a bedroom would be a great spot for something like this plus a little chair for reading. Incorporate a tall shelf or shallow racks on the wall to store books. Get creative with storage – think up and under! 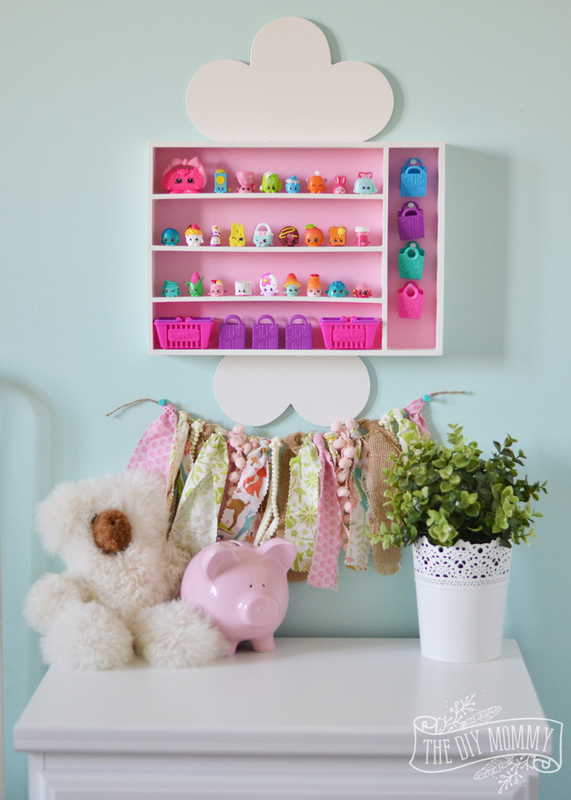 Especially if you’re working with a small room, think of creative ways to store kids’ items. Putting shelves or other storage systems on walls is a great way to keep things up and off the floor and other surfaces. Think up! We still love this collectibles storage shelf we made for Little A from a cutlery tray. Don’t forget the storage options that lie beneath things too. Think under! You can store a lot under beds in boxes, or look for furniture with hidden storage compartments like this Pheonix Bunk Bed from The Brick that we’re using in Ruby’s room. 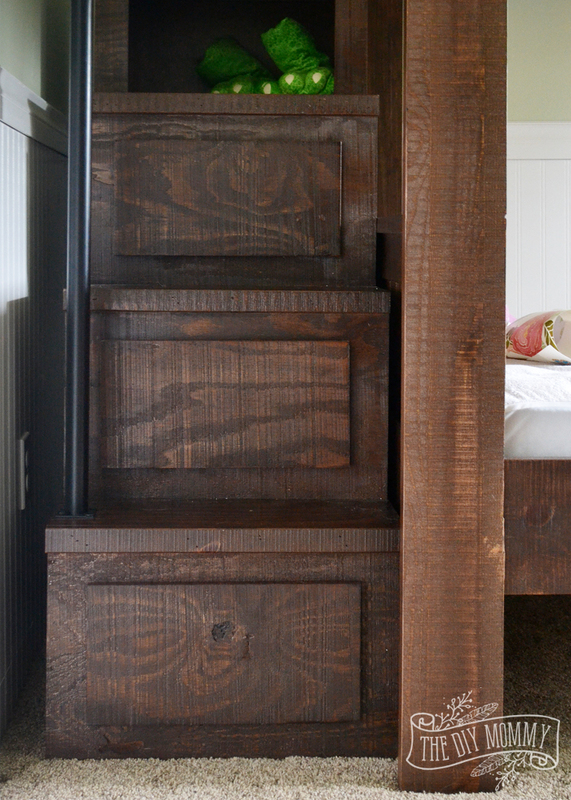 It has fantastic cubbies and drawers under its stairs which are fabulous for storing and organizing kids’ items! This bunk bed and the matching dresser look SO good in Ruby & Zoe’s bedroom already, and I can’t wait to share the final room reveal with you soon. Happy organizing! I’d love to hear your kid bedroom organizing tricks. Please leave them in the comments below, or visit me on Facebook and share your ideas for back-to-school organization. I love it!! I have 4 kiddos one girl and three boys.i need some ideas for the kids room.your ideas it help me to do project each room that I need to work on thank you.